If you were to ask him, Cory would gladly regale you with the story of his first pad ga prao (stir-fried Holy basil) experience. We were at Victory Monument in Bangkok awaiting a van to Kanchanaburi, my home during my stay in Thailand. We had a few minutes to kill and Cory was starving so we sat ourselves down at a tiny metal table outside a ran ahaan (restaurant) on the corner. They had a large pan (similar to those you use in catering) filled with piping hot pad ga prao moo (stir-fried pork and Holy basil). Cory ordered a plate along with a fried egg and began to chow down. He wasn’t more than a few bites in when he looked at me – an expression of delight and pain mixed into one. The dish was spicy … really really spicy. He made his way through the dish and finished every bite, but it took quite a bit of effort, sweat, and perhaps even a few tears. But, to this day Cory still says it’s one of the best plates of Thai food he’s ever had. In the years since then and the multitude of Thai restaurants we’ve tried we have never once come across a plate of pad ga prao that delicious, and not for lack of trying. This particular dish is one of our favorites and I’m not exaggerating when I say we’ve ordered it at probably 90% of the Thai restaurants we’ve visited. I will say there are some good dishes out there, but none come even close to that one single plate of food … and I know exactly why. You see, in Thai cooking they use multiple different kinds of basil depending on the particular taste they are trying to achieve. They are all delicious in their own right but each provides a unique taste that makes certain dishes distinctly individual. Pad ga prao is one of those dishes. Traditionally, as stated in the name, this dish is made with bai ga prao, or Thai Holy basil, as opposed to bai horapha (Thai sweet basil) or bai maeng-lak (lemon basil). When you trade out one basil for another, you change (often drastically) the taste of a particular dish and that is exactly what we constantly experience in Thai restaurants locally. Thai Holy basil, the traditional star ingredient in pad ga prao is incredibly difficult to find in the states. It requires a specific growing environment and is a very fragile plant that doesn’t travel well. So, the majority of Thai restaurants choose to substitute the Holy basil with the more widely available Thai sweet basil. Why they still call it pad ga prao I will never know, but I digress. The point is that the type of basil you use in Thai cooking is important! You technically can use whatever you’d like, but don’t expect to get that same awesome authentic taste you’ll find in a traditional and properly made Thai dish. To help you out a bit, here is a brief description of each of the three main types of basil used in Thailand along with a tidbit on the traditional basil used in Italian cooking. If you can take the time to find the appropriate basil called for in your recipe, you’ll be a much happier camper. Thai Holy basil is used in many types of dishes including curries, soups, stir-fries, and salads. So delicious! Thai ‘sweet’ basil grows from a purplish stem and sprouts spear-like leaves with a slightly jagged edge. This basil has a distinct scent similar to that of anise or licorice and is sometimes referred to as anise basil for that reason. This basil is the most widely used in Thai cooking and can be found in curries, soups, stir-fries, and salads. This basil is also sweet enough that it can be eaten raw as well as cooked within dishes. You can find this basil at nearly all Asian markets as well as some grocery stores with a decent ethnic food section and it usually isn’t too expensive either. Locally, my favorite places to buy this basil is JD’s Market in Lynnwood (super inexpensive) and Uwajimaya in Bellevue (great quality, very fresh!). I’ve also found that it keeps the longest of all the basil types that I’ve tried. Holy basil is used mostly in stir-fried dishes and has a very spicy or peppery taste. Very difficult to find in the Pacific Northwest! Thai Holy basil is very different from the sweet basil both in look and in taste. Holy basil, also called hot basil has a reddish purple tone around the stem and base of the leaves. The leaves are also jagged but are smaller and more fragile and slightly fuzzy to the touch. This basil gives off a scent similar to cloves and has a very peppery taste. It adds a spiciness to dishes (hence being called hot basil) and is best if eaten cooked rather than raw. This basil is mostly used in stir-fried dishes. Holy basil is very difficult to find locally. You can easily find seeds to grow your own but quality seeds are also hard to come by and the weather/temperatures in the Pacific Northwest make it difficult. You can order Holy basil plants from a few websites but they only ship during ‘on’ seasons which are approximately April to July and again October through December. Lemon basil is used in some very specific Thai dishes including khanom chin nam ya. Unlike Thai sweet basil and Holy basil which can be interchanged without completely ruining a dish, lemon basil has a very distinct lemon/lime taste and there isn’t much alternative. This basil has pale green leaves that are a bit less jagged than the previous two with a hairy/fuzzy feel. This basil is used in many dishes as well as being served as a garnish in some very specific Thai dishes including khanom chin nam ya. Lemon basil is also very hard to find locally but is much easier to grow and keep alive than Holy basil. It’s worth a shot to try this one in your herb garden or greenhouse! You can buy seeds at some local Asian markets like Uwajimaya (they have a stand near one of the doors). You can also order them off line at Amazon or some online gardening sites. Sweet basil is used mainly in Italian cooking and should not be subbed into Thai cuisine if you want an authentic taste. 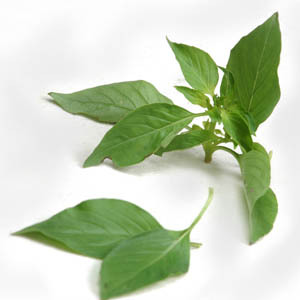 Not to be confused with Thai Sweet basil, this basil is the one commonly used in Italian cooking. These leaves are oval shaped and the stemmed look square. The leaves also often have a shiny quality to them. This basil tastes sweet and slightly peppery and are often combined with tomatoes or other vegetables to enhance flavor. The leaves are often eaten raw or mixed in at the very end of dishes so they are served slightly wilted. Sweet basil can be found in nearly every grocery store … anywhere. *Note* Due to the fact that I cannot find some of these basils I had to search for some quality photos to use. Please click on the photo to be directed to the original source which may also provide some interesting information about these basils that I didn’t include in my entry. ← I’ll take the Phad Thai … hold the chopsticks. I’m now a basil expert!!! That sounds great, Debbie! We are looking into getting a small greenhouse for the backyard and if we do then Holy basil will be one of the first things we start to grow! Let me know how it goes for you.